Sweet Orange Essential Oil has a sweet, citrus smell much like the orange peels it is derived from, only more intense and concentrated. 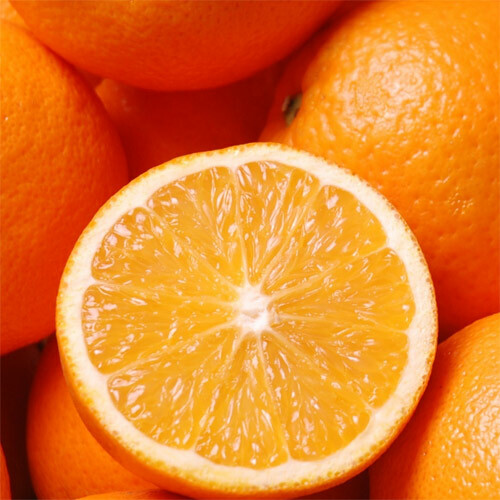 Sweet Orange is derived from an evergreen tree. It is smaller than the bitter orange tree, and less hardy with fewer or no spines. The fruit itself has a sweet pulp with no bitter membrane. Properties for Sweet Orange Essential Oil are as follows: antidepressant, antiseptic, antispasmodic, aphrodisiac, carminative, cordial, deodorant, digestive, stimulant (nervous) and tonic (cardiac, circulatory). It has also been applied to combat colds, constipation, dull skin, flatulence, the flu, gums, slow digestion, and stress. Some aromatherapists have reported that a small percentage of few people have experienced dermatitis from the limonene content of sweet orange. Orange Essential Oil is considered photo-toxic and exposure to sunlight should be avoided. Do not use if pregnant.